The #1 train has been rumbling past the World Trade Center since 2002, a year after its tunnel and tracks were destroyed on 9/11. But the rebuilding of the Cortlandt Street station where it used to stop is yet to be completed. That work is ongoing and now set to be finished—about four years behind schedule—at the end of next year, according to an MTA official. 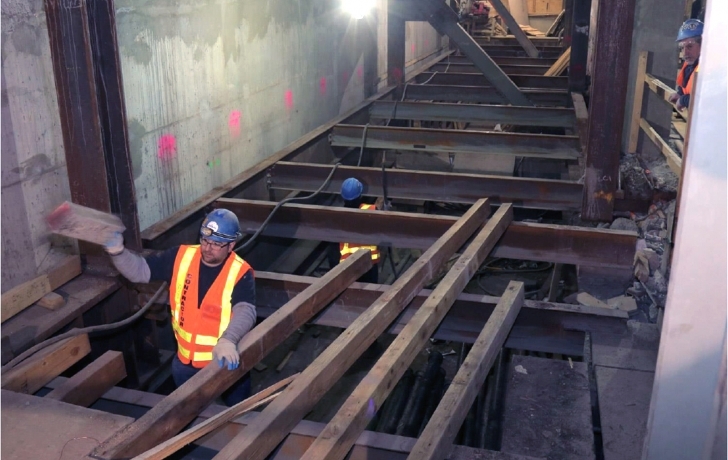 In a recent update to Community Board 1, MTA Capital Construction Executive Daniel Creighton said the addition of extra communication systems to the original project is partly what has delayed the opening. That technology, he noted, will be state-of-the-art, including its public address system, help-points, closed circuit TV, lasers for detecting tunnel intruders and cameras to monitor the platform edges. “We’ve pretty much redesigned everything that you’ve seen in any other station,” Creighton said. While that work is now moving ahead, Creighton said, other parts of the construction is still the subject of negotiation with the contractor. The MTA took over the $158 million project from the Port Authority in February 2016 following a dispute with the Authority over construction costs. Negotiations with the contractor over changes to the design also have led to delays. It’s a complex project made especially difficult, Creighton said, because the new station is being constructed next to the active #1 line. “All this work was ongoing while these trains were going through,” he said, showing slides of freshly installed track, masses of new utility conduits, partially completed platforms and an impressive array of other work in mid-completion. All the track work is finished, Creighton said, while about a three-quarters of the station’s fit-out and installation of systems is yet to be done. There is progress, he assured the committee, but it is mostly out of sight. Creighton said the station will match the feel of the gleaming white interior of the World Trade Center Oculus, where it will have an entrance on the mezzanine level. Artwork by Ann Hamilton, in the form of text from historical documents, will be engraved in tiled walls. The station will be air-conditioned. Along with its Oculus entrance, riders will be able to enter and exit the station from 4 World Trade Center and from outdoor stairs to the southbound platform, east of the 9/11 Memorial. Creighton announced other subway connections in the works at the World Trade Center, including: A direct connection between the Oculus and the R train; a corridor connecting 2 World Trade Center with the A and E lines; a free transfer between the E and R trains; and a connection between 4 World Trade Center and the R line.